Of course it has a V8, too. Chevrolet has introduced its new Tahoe and Suburban RST special editions, both described as street performance Rally Sport Trucks, hence the RST name. Why should they interest you, especially if you’re an SUV fan? Because they’re powered by a 6.2-liter V8 with 420 hp and 460 lb-ft of torque paired to an all-new 10-speed automatic transmission. This V8 features direct injection, Active Fuel Management and continuously variable valve timing. And then there’s this: Magnetic Ride Control. That's the very same active suspension found in the likes of the Corvette and Camaro. This system "reads" the road every millisecond, triggering damping changes in the electronically controlled shock absorbers in as little as 5 milliseconds. MRC is particularly nice to have on a full-size SUV because it helps improve overall body control. "When you want to hustle, it is incredibly fast, with significantly higher levels of acceleration, braking, and road-holding grip," stated Eric Stanczak, chief engineer for Chevy full-size trucks. Chevy claims the RST SUVs are inspired by aftermarket trends, examples being all of the chrome trim being eliminated in favor of a more street performance look. Other exterior changes include a body-color grille surround and door handles, gloss-black grille and mirror caps, along with black roof rails and window trim, and black Chevy bowties. Each SUV rides on a set of 22-inch wheels. Another optional upgrade is a Borla performance exhaust with a 28 percent improvement in exhaust flow, resulting in a 7-10 hp gain at the rear wheels. There’s also a brake package with massive front red Brembo six-piston, fixed aluminum calipers. 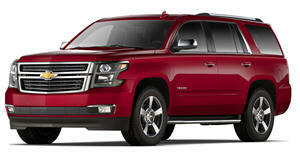 Chevy says the Tahoe and Suburban RST haven’t been officially tested yet performance wise, but preliminary estimates show a 0-60 mph time of less than 6 seconds for the Tahoe, which has an 8,400 pound towing capacity. Sales will begin shortly, and pricing hasn't been revealed. 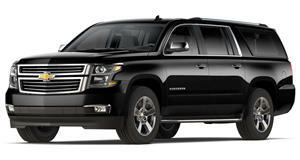 If huge SUVs like this are your thing, the Chevrolet Tahoe will tick many of your proverbial boxes.